Whenever I'm asked how well a polish wears, I usually don't even know. My job doesn't let me wear fun colors, so most of what you see was on my nails for maybe 20-40 minutes. Even if I do wear something for a while, I'll generally only mention wear as an aside or if it's usually poor. In general, I don't feel like wear testing is worth doing for "standard" polish. A recent-ish mani inspired me to explain why. This is Sinful Colors Silver Solution over Beige Of Honor, after a week of wear. More specifically, this is two coats of Nicole by OPI Strengthener Plus, two of Beige Of Honor, one of NYC Grand Central Station, two of Silver Solution, one of an old Sally Hansen top coat that's discontinued, and one of Seche Vite. A week might be a personal record for me. It only happened because I did a lot of driving around looking for a specific present for The Beard. I didn't find what I wanted, but I bought a lot of polish. How'd that happen? Anyway, it meant I didn't have a lot of downtime at home and I lucked out that my mani lasted. I had some tipwear and Beige Of Honor was starting to show through a bit, but the part that bugged me most was how huge the gap got. Look at this! I had chipping on both thumbs too, but very minor. ...and while we're at it, a better look at the tipwear. So really...not bad for a mani done on 7/8 and not changed until 7/15, right? I usually get bored with a polish and change it before it ever chips. What's my secret? I can't really attribute it to one thing, and that is why I don't believe in wear testing. Too many factors affect how polish lasts. Everything from nail strength, thickness, shape, length, and use to the polish itself, the application technique, and the other products used. I think by now we've all seen this Consumer Reports article about how well different brands wear. The best thing I can say about it is that they had one manicurist apply the polish. That knocks application technique off the list of variables. The biggest flaw was that they used each brand's "corresponding" base and top coats. Huge mistake, as far as I'm concerned. Base coats are almost as varying person-to-person as things like moisturizer or foundation and once you find what's right for you, pretty much any brand of polish will wear better. It seems like they tested Sally Hansen Complete Salon Manicure and CoverGirl Outlast without any base or top coat at all. They even included *wince* Nutra Nail Gel Perfect, which is essentially super glue. Yuck. I don't agree with their methods, but if it steers people toward trying bargain brands I'm all for that aspect. After all, the week-old mani you saw above did use Sinful Colors polishes. Avoid over-buffing. Nails that are too smooth don't give polish a good gripping surface. Prep matters: Some people use oil, others prep with acetone or vinegar. Either way, it's best to start clean. Don't skip the base coat! Find your base: Try different base coats until you find the right one. You'll know. Life changer! A gap at the cuticle will reduce the chance of lifting. Wrap your tips with base, color, and top coats. Hone your technique: In general, go thin on the first coat and a little thicker on the second/third. Don't skip the topcoat either! For mattes, chromes, etc, put the topcoat under the last coat of color. The old "jewels, not tools" line: Treat your nails well for fewer breaks and better polish wear. Wear gloves when your hands will be in water for long periods. 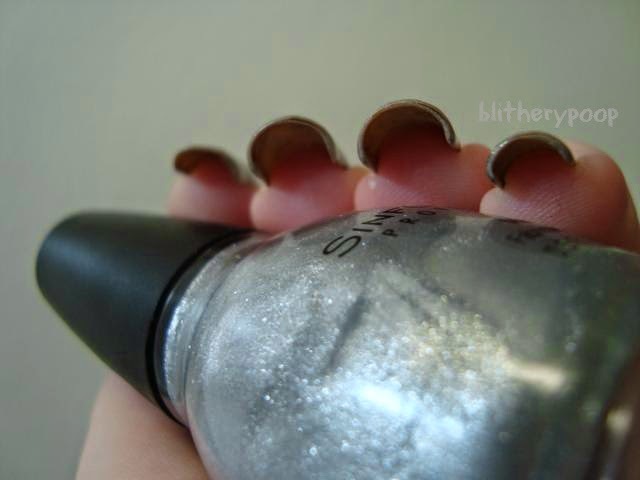 Nails swell quickly when wet and polish may detach. Avoid hand sanitizer gels when possible. Be cautious with bug repellent and sunscreen too. I think there are times when wear testing makes sense. Gel and "gel-like" systems are one example. I think when a brand makes a boast about wear-time or a "revolutionary new formula", a test is important. For standard polish though, I think base and top coats matter as much as the color itself...if not more. Well said! I usually don't wear any mani for more than 2 days, so I totally agree with you that giving a wear report is rather pointless unless a particular polish fails in an epic manner. I do pretty much all the 'boosting' gems you listed & even though I change my polish frequently, I can easily get a week out of most manis (with minimal tip wear & no chipping) when real life interferes with my polishing. And here I am...doing a wear test. ...of a "revolutionary" new gel-like system. That's what should be tested. How's it holding up? I love your list of polishes! My manicures are always so all over the place with brands. Different top coats behave differently with certain brands and finishes! It's so hard for me to keep polish on for a long time, too... Love this post!!! "For mattes, chromes, etc, put the topcoat under the last coat of color." WHOA! Mind blown! I've never thought to do this, so I tend to avoid mattes. This may be a total game changer for me! Thanks! Also, finding the right base and top coat is SO important. I could not get polish to stay on my nails until I found mine. Now I can get any polish to last at least a week. My HG top and base is Winning Nails Tough Coat Bonder/Sealer (Available at Sally Beauty Supply, $3.99). No one ever talks about this product, but it's a miracle to me. It works with my personal chemistry, which was, I think, the major problem I was having with getting polish to stick to my nails. Awesome blog, BTW! First time commenter, but long time lurker. I always look forward to reading what you gals have to say. Keep up the good work!